March 23, 2017 January 14, 2019 ~ Mike K.
Well, Mike and I have been through every other room (Jail Bus not withstanding) together in this location, so we figured, why not? I expected it to be good and I wasn’t disappointed. We kinda needed to prove to ourselves that we could do one on our own anyway. (I mean, was there ever any doubt?) This was also our 25th room done together. Good challenge, right? Nailed it! This was the last room we needed to do at this location, and one that we’ve been meaning to do for awhile based on how much we enjoyed the other rooms. I liked the theme (we had done a similarly themed room as our first room), but this one was a bit more intense. You metaphorically blow up if you don’t complete the mission! It was a standard Monday night, and we were chatting about this blog and surprised that we had done 24 rooms together in just a bit over a year and were coming up on 25. Holy crap! Is there an Escape Room Addicts Anonymous group in the metro area? Please use the contact form to send us the info if you know of one. Jason threw out a challenge… that the ERG should do this last room in this location on our own to prove to ourselves that we could escape a room on our own… even one rated for up to 10 people at normal level. Challenge: Accepted! He looked up the number of bookings for this room for the last two time slots, and no one else had bought any spots. We called and asked if they anticipated any walk-ins. Hearing that it was unlikely, we hopped in the car and headed over to Fairfax. If you recall, this location is the one that has informative videos played for us before entering the room, as opposed to having the GM get us all riled up. This one, though, was the best one of all of 6 there, by far. Flyovers of the actual White House (hey, we’re close enough, right?) and the tone in the narrators voice made it pretty awesome. Trapped in a locked down Oval Office, there’s been a bomb somehow armed in the office itself by a radical group that apparently is strong enough to take out part of DC. Hurry the hell up and disarm it already! Geez, the heck are you waiting for?? And Mike, no, no one ever thinks of the children. Rating: 8/10 The back story has some nice detail to it and does a really good job of prepping you for the experience and pumping you up for the mission. Again, in this location, they invested in creating some great videos to give you the briefing. A radical group has infiltrated the White House and planted a bomb to assassinate the president. The failsafe activates but you didn’t get the president out in time and now you’re trapped. Hmmm… I wonder if perhaps “he” is hearing about Escape Rooms and is confusing the stories for them with actual attacks? (*Googles “Bowling Green Escape Room” and checks the results for any terrorism rooms*). I wonder, perhaps, in this current political climate whether it would be better to change the story line slightly to say that.. maybe… a group of school children on a field trip to the White House is trapped and your mission is to find the bomb and save the children. Everyone would save the school children, right? Won’t someone please think of the children?! Because we are such Super Duper Secret Service agents, we apparently failed to get the President to safety before lock-down was initiated, so we MUST disarm it. One objection. One very IMPORTANT objective. Rating: 8/10 Pretty straightforward: solve the puzzles and find the bomb to disarm it in under 60 minutes. We’re trained Secret Service agents, right? No problem (but how the hell did a radical group hide a bomb in the freakin’ Oval Office?). This isn’t a commentary on the mission or the room itself, but it’s pretty funny. Only one mission objective here, but it’s compelling and has the thrill factor, so I’m not as concerned with my normal “multi-objective” obsession with the mission that I normally am. However, maybe discovering a rogue Secret Service agent who allowed this to happen could be a great secondary mission. 2 of us. That was it. We figured going into this room that it would be a lot to work through and I literally ran around the room a few times. We threw things across the room to each other on multiple occasions. And the Boogie Board was useful (as was the provided white board). Even after 27 rooms (I’ve done 3 in NJ as well), I still encountered a bunch of new stuff used in unique ways. I was impressed. A couple puzzles were actually fun (and logical, come to think of it). While most things were locks, I didn’t feel like I was just fishing for combos just for the sake of opening them. Everything worked well and I actually enjoyed running around puzzle to puzzle. It was a bit of a thrill, really. And yes, we did work together to solve about half of them. Rating: 10/10 So, we knew that only having two people in the room was going to be a challenge when it comes to solving the puzzles. After doing 24 of these together, we’ve found that while we have similar ways of approaching the puzzles, we actually have different thought processes that get us there, so this was going to be a good test at our teamwork. There were so many different types of puzzles, and at least 5 we had not seen in some fashion before, and that’s hard to do after the hundreds of puzzles we’ve had to solve in our tenure as the ERG. I particularly liked some of the tech used in this room, but I’m not going any further to avoid spoiling the experience. Because of our experience in other rooms, I invested in a Boogie Board just in case the room didn’t have a white board (this location does, by the way). We found out afterward from our GM, Andrew, that they had begun cycling in new types of puzzles to replace key and combo locks (although we saw some of these too). This one’s kinda complex (HA!) to write. We keep going back to the fact that there were only 2 of us in the room, but I think, as we stated in our suggestion earlier, that 5-8 people would be gold. As Mike says, there were 1 or 2 30-second puzzles, one puzzle Mike only got because he applied some puzzle experience to it, and only 1 puzzle that we had to take turns trying. There were a few puzzles that definitely required teamwork (I’m looking at you, President photos… HA: looking, photos, ha!). Rating: 8/10 There was a great variety of complexity on the puzzles in this room, from items we solved in under 30 seconds to others that we spent upwards of 5 minutes. We were challenged the entire time we were in the room (again, being only two of us, we had a lot of stuff to solve), so I’m rating this based on our experience vs. the experience a group of 8 or 10 may have (I’d probably subtract a point from my score below with a full team in place). I’m glad there was at least two of us. We had to use a lot of teamwork to get everything resolved in time… and some of the puzzles seemed to require that teamwork to be successful. Aesthetically, I bet they could have done all of this in a smaller room (or put in more puzzles to solve, in which case we probably wouldn’t have had enough time just the 2 of us (but you can make it if you try…)). It did have a bit of a linear feel to it, but there were a few times Mike and I were each actively trying to solve different things. Rating: 9/10 All the puzzles and clues fit the theme well, and the room is decorated to mimic a combination of the Oval Office and the room where the Cabinet meetings are held. A nice touch for the long table would maybe to have placards for Secretary of State, Defense, etc. (a very minor suggestion… the room is done quite well). The props lent themselves to the room too, and we saw some great new puzzles here that were unique to this room. I absolutely loved the one in the corner of the room and think it was pretty brilliant. It wasn’t overly complex, but its simplicity was perfect in its frustration level. We figured out pretty quickly what we had to do, but it still took us a few minutes to solve it. I’m sure that this one stumps a lot of groups. Now, everything said, the room does have a bit of a linear flow (solve one clue to get you to the next one). This didn’t bother me as much as it normally would since there were only two of us, but a large group may find this a bit more challenging to engage the entire team on solving the puzzles. I had more fun doing this room than I thought I would (or than I probably would have with a full team). But then again, half the time I’m not playing with a full deck, so what’s the difference? If nothing else, it would have been a great experience and a great way to test our mettle. And crap, I didn’t even think about that! (Referring to the challenge of telling people we were doing this.) Whoops! I don’t know if fun or amused would be the words to describe the experience as I was going through it… frantic at times (hahaha), methodical at others, but once we solved the room, it was very satisfying and I really did enjoy doing this one. So, yeah… it was a lot of fun. And I’ll say that it was a hell of a lot of fun trying to determine if just the ERG could do the room. Jason and I debated whether we would tell anyone we were doing it in case we failed (hey, we have a rep to maintain), but ended up doing the Facebook Live videos, so our challenge was made public right before we went in… no backing out then! We’ve worked with Andrew multiple times and he knows us well enough now to just keep an eye on us and chime in with “Would you like some help?” or something similar. Andrew was pretty great. As mentioned, you watch a video to give you the backstory and briefing, but he was really attentive on the walkie talkie and gave us smaller nudges (like “you are on the right track when you were doing X” or “that item doesn’t play into what you’re doing”) rather than full on directions (you need to do this exactly) when we asked for clues. I’m not ashamed to admit it (this time), but we did ask for some help. You know me, I’m the anti-clue guy (I want to make that damn leaderboard!) so if I say we need a clue, you know we actually need one. So yes, we asked, and they were helpful. Nothing directional, but merely a point and look kinda thing. The 3 clues we got were absolutely helpful. One was more of a clarification that something that we thought was NOT part of the experience (but part of the room itself) was actually something we needed to engage once we stalled. One was more of a full directional clue to operate something correctly. Rating: 0/5 Fists I actually did FacePalm at one point, when we were at our stalled point and had to resort to asking Andrew for a clue to move forward. Once he said that something was part of the room, we realized that we should have looked for that F&#%ING “Not part of the room” sticker before discounting it. I’m going to propose adding this as another rule… if something does not have a sticker on it, it’s fair play even though it may look like it’s part of the room construction vs. experience. Final Thought: We loved the fact that we were able to tackle this room on our own and complete the mission. This was a milestone for the ERG… 25 rooms completed together and the only one to date where it was just the ERG. 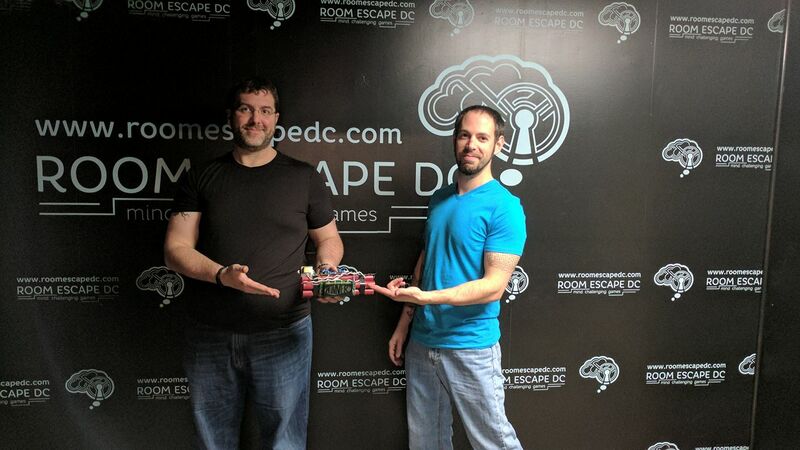 The room is done extremely well, and we liked it so much that we’re going to propose to our normal team (Disturbed Friends) that they do the room without us (kind of a test for them too) and ask Room Escape DC if we could monitor the room while they are in there or even GM their game. Next > Never, EVER drink the KOOL-AID™!! – Room: Insane Asylum II – Saturday, March 25 – FAILED! I just wanted to let you and your readers know that we will be revamping Save the White House starting on May the 23rd. The puzzles will be 100% different and slightly more modern. For those who haven’t played the original STWH yet, we hope to see you before it’s retired, though we can promise you that Save the White House 2 will be even cooler!